Each year, doTERRA releases a Mother’s Day special and this year it is amazing! It is a BRAND NEW TRIO of citrus oils – kumquat essential oil, Sunny Citrus blend, and Red Mandarin essential oil. Can you say AMAZING? These oils will be released on April 18th, 2017 and will only be available to wholesale members at a wholesale price of $28.50 – for the entire set! That is a steal! Members are limited to 2 per account and are available while supplies last, so grab yours quickly! If you are looking for other Mother’s Day gift ideas, here are some other ideas for you! The Summer Sunsations kit features doTERRA Tangerine, Cumin, Dill, and Spearmint essential oils. A great way to share essential oils with mom’s who love to cook! 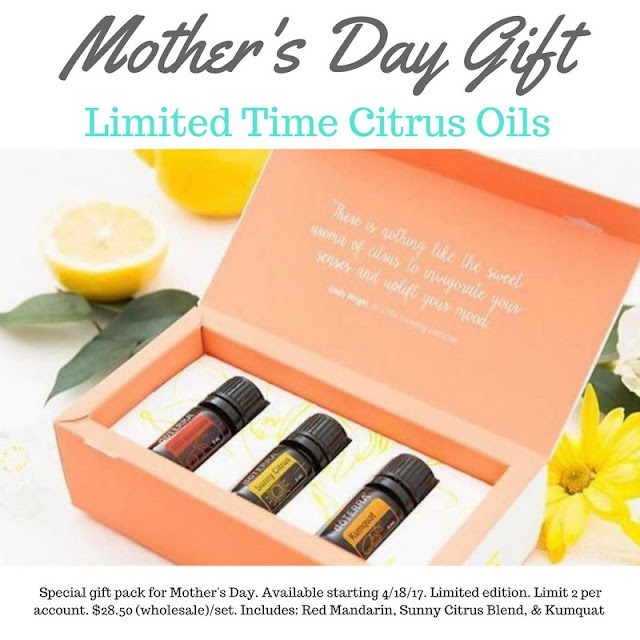 These oils are also a limited time offer, so get them quickly before the Mother’s Day rush! Flavor your cakes and cookies with doTERRA Tangerine essential oil, make tacos with doTERRA cumin essential oil, salad and pickles with Dill, and fresh drinks with Spearmint! Every mom deserves to be pampered, even if she is at home! Did you know doTERRA has a complete spa line featuring essential oils? Yep! These luxurious spa and shower products would make a wonderful gift for your Mom…or for yourself! You deserve a Mother’s day gift, too! Enjoy the special benefits of essential oils each time you use your soaps, shower gel, lotions or shampoo! Every mom gets stressed out and goes through the ups and downs of emotions when “life” happens. Maybe the 2 year old is going through the “terrible twos” stage, the hubby is out of town for work, or she is playing chauffeur for 3 kids in sports! This is where the Emotional Aromatherapy kids comes to the rescue! Six different essential oil blends that are special and unique… just like Mom! Each blend benefits emotional health and balance. The beautiful aromas could simply stand alone as a natural and non-toxic essential oil perfume. The doTERRA emotional aromatherapy kit contains: Motivate blend, Cheer blend, Passion blend, Forgive blend, Console blend, Peace blend, Petal essential oil diffuser. Or just get the Emotional Aromatherapy Touch kit, which is the same oil blends, but already pre-diluted in rollerball form!